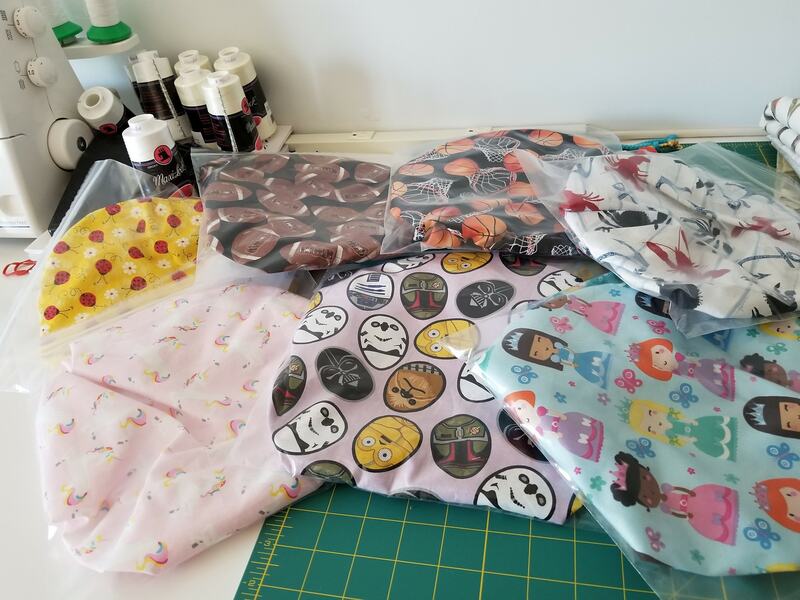 Our volunteer, Georgia Harris is using her skills and having some creative fun by making and donating children’s size surgical caps. 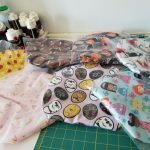 Georgia is using various kid-appealing fabrics for children who will be having procedures/treatments. The children get to pick out a cap of their choice which they use and get to keep. Cotton/polyester blend fabrics. Choose designs that are suitable for children. Fabric should not have glitter, sequins, textures or any other materials attached on it. 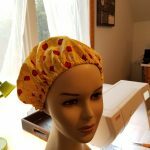 There is no need to prewash the fabric or caps. 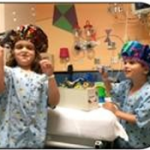 The caps are going to go through rigorous washing and drying at the hospital to ensure they are sanitized before entering the operating room. Cut out a circle that measures 18 ¾ inches in diameter. You’ll save time by using pinking shears or a rotary pinking cutter. If you use straight edge scissors or rotary cutter you will need to overcast the edge of the circle to prevent fraying. If you used a straight edge scissor or rotary cutter you will need to overcast or serge the edge of the fabric to prevent fraying. Fold over ½ inch around the edge of the cap to create a casing for the elastic. You can do this as you sew or iron it down ahead of time. 2-inch opening for feeding through the elastic. Since it’s a circle you are going to have to ease it over to prevent bulges and gaps. A circle has a good deal of bias on the edge. This means it has stretch. Slightly pull and stretch the fabric towards you as you feed it into the machine. This will help prevent creases and gaps and allow it lay flatter. It’s not easy keeping an even casing on a round edge. After you do a couple it will get easier. Cut a 19-inch piece of 1/8 inch elastic. Thread it through the casing. I highly recommend using a Dritz Drawstring Threader. Tie the ends of the elastic together tightly close to the ends. Cut off any excess but don’t cut too close to the knot or it will come untied. Spread the gathers out evenly. I’m all about saving time and money. Here are some of the things I’ve learned making these caps. Create your template out of something durable. I have an awesome husband who made one for me out of plexiglass. Corrugated cardboard would work just fine. Then you can just run a rotary cutter around the edge. Saves time not having to pin and unpin a paper pattern. You’ll have to replace a paper pattern more often. Choose fabrics that have even just a hint of white. This will allow you to use white thread throughout the process. If you are making several at a time it means you won’t have to change thread for different colored fabrics. Buy fabric when it’s on sale, from discontinued shelves and remnant bins. Use your craft store coupons! Buy thread and elastic in bulk. White thread is cheaper. You can get a good deal on a three pack of Coats & Clark white all purpose polyester thread at Amazon. You can also get a good deal on 50 yards of 1/8 inch white braided elastic at Amazon. Take one of those spools of thread and wind up some bobbins before you start. Then you don’t have to stop to load up a bobbin in the middle of your work. Just pop in a preloaded one. Place a pin in the opening of the casing so it’s easy to find it when you go to run the elastic through it. Buy a Dritz Drawstring Threader. It only costs about $3 all over the internet. It will save you time and finger pain. If you are doing several at a time pushing a safety pin through the casing will get tiring on your fingers and hands. This tool makes it a snap! If you have any questions, need some help or have tips and tricks to share with others, please drop me a note at caileagh@gmail.com. Contact Melissa or Jan if you are interested in participating in this project. This entry was posted in Current Projects, Patterns, Volunteer. Bookmark the permalink.